On the occasion of World Environment Day 2016, Nagarik Mancha has taken an initiative of holding a Program of “PARIBESH CHARCHA NANA MADHYAME” ( an environmental culture from different angle) on 7th and 8th June, 2016 from 2pm to 8pm at SharatSmritiSadan, Rasbehari Avenue (near Ballyganj Triangular Park), Kolkata-29 .This initiative is in associationwith andin patronage of some other organisations : Inititive For Healthy Environment And Culture(IFHEC), Third Eye Photography, ChakdahaBiggan O SanskriticSanstha, BigganAnwesak, EMPATHY, ParibeshBandhab Mancha- Barrackpur, Calcutta Ahead, Sabuj Mancha and others. The program will be inaugurated by the eminent environmental Scientist ShriDhrubajyoti Ghosh at 3 pm on the 1stday( 7th.June/Tuesday).Shri SujayBasu has kindly consented to adorn the chair as Chief Guest . KalyanRudra,Debashis Kumar, ArunavaMazumdar, S.P. Sinha Roy,Pradip Kr. 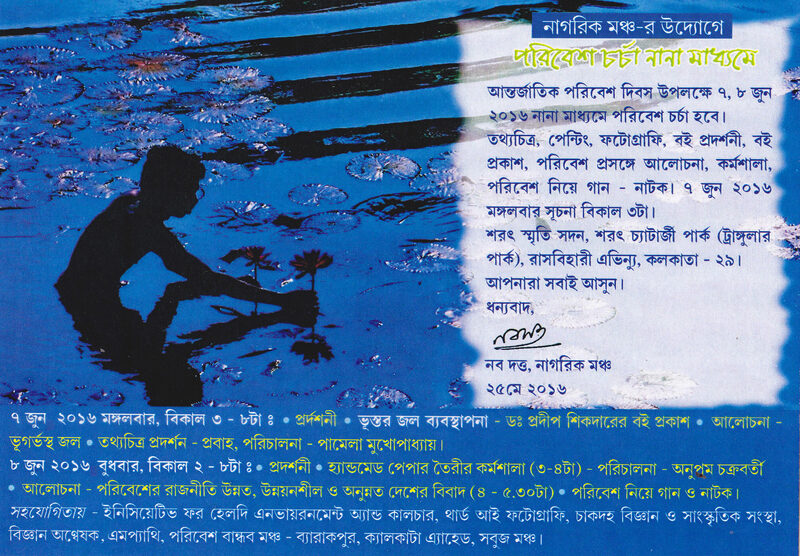 Sikdar, AshisMazumdar, Aniruddha Mukherjee, KrishanuChakravorty, TusharChakravorty, Subhas Dutta, Samar Bagchi,Meher Engineer, JayantaBasu,DulalBasu, Subrata Ghosh , Rabin Mazumdar, Milan Dutta, SuvenduDasgupta, Biswajit Mukherjee, Subhashis Mukherjee, SmtSaswati Sen and others. 2)Workshop on Producing Handmade Paper: Demonstrator: AnupamChakravarty(3pm to 4pm). Exhibition of Organic Food/ Agro products on both the days. You are cordially invited to participate in the Program and your environment oriented presentation is welcome.